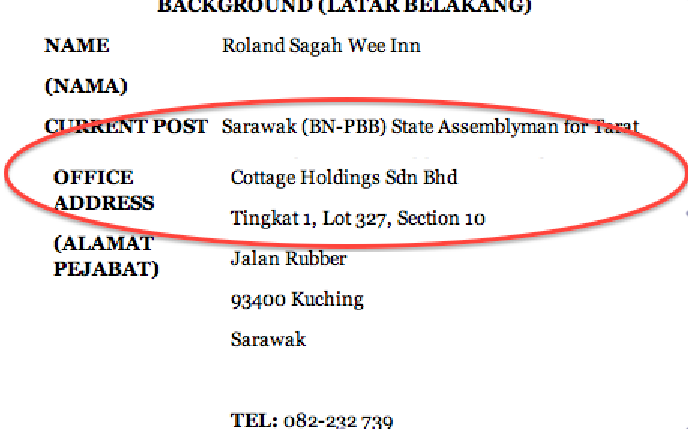 BN YB Roland Sagah’s ‘Cottage Industry’ – Expose! 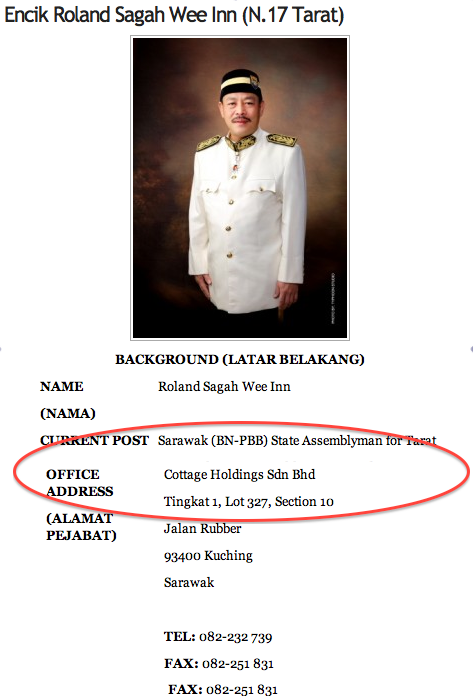 Blatant - you can reach this YB at his office address at Cottage Holdings Sdn Bhd, a multi-million ringgit public contractor!! Outraged readers of Sarawak Report have been queuing up to dish the dirt on BN’s Dirty Datuks over the past few days. We have received widespread information about corrupted practices from insiders, who are clearly sickened by the greedy YBs, who have been cheating their constituents for decades. And it seems that many of those YBs, who have been in office longest, have lost any shame over admitting that they use their positions as elected representatives to get public contracts. Roland Sagah Wee Inn, Assemblyman for Tarat, who has been in office since 1996, is one such example. 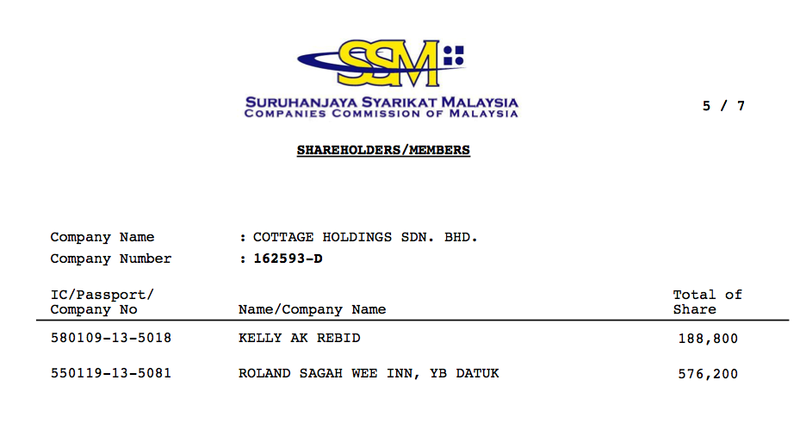 He openly proclaims on his Sarawak Page entry, next to his lengthy political career, the fact that he is also the Director of Cottage Holdings Sdn Bhd. Cottage Holdings is a contractor, which has received a string of public commissions ever since Sagah got his seat in 1996! Tight shot - the private office where you had best try reaching this publicly elected official. Hope he has time for his constituent business with all those contracts to worry about! Cottage Holdings may sound a humble affair, but it actually does very big business indeed. Under the title of ‘General Works” and ‘Transportation Services’, it has won a numerous public contracts. Starting in 1998, two years after Sagah settled into office as a faithful PBB State Assemblyman, the work has just flowed into the company from the grateful government. The list at the official Construction Industry Development Board (CIDB) shows no less than 59 major public contracts totalling some RM50 million ! 28. The Proposed Construction And Completion Of 2 Units Semi-Detached Type ‘B’ Factory (sublots 21 And 22) For Phase 1, Stakan Mixed Development At Jalan Stakan, 07-03-2007 RM 367,714.00 BORNEO DEVELOPMENT CORPORATION (SARAWAK) SDN. BHD. 31. Proposed Design, Const & Completion Of Pesantren Abdul Taib Mahmud (PATM) Di Sadong Jaya, Kota Samarahan (Road, Car Parks, Drains & Turfing) 26-04-2006 RM 938,500.00 BORNEO DEVELOPMENT CORPORATION (SARAWAK) SDN. BHD. 35. The Proposed Construction and Completion of 6 Units Detached Factory (4 units Type ‘A’ Sublot 1-2 & 5-6 And 2 units Type ‘B’ Sublot 23-24) For Phase 1 Stakan Jaya Mixed Development at Jalan Stakan Melayu, 25-10-2005 RM 1,104,098.00 BORNEO DEVELOPMENT CORPORATION (SARAWAK) SDN. BHD. RM50 million in contracts may not be the same sort of money that the likes of Alfred Jabu, the Deputy Chief Minister has been making out of the companies his own family runs. Or indeed Daud Abdul Rahman’s Eastbourne Corporation construction and property empires, which are worth billions. However, as a former barrister trained at Grays Inn, London, Roland Sagah can only be too aware of what constitutes conflict of interest. And he knows that his new career as a part-time politician/ part-time construction company director is a very good example of it. Clearly, he just wasn’t making enough out of his legal practice and his Assemblyman’s salary to keep him and his wife happy. In fact it is his wife, Kelly Ak Rebid, who lives with him at his home, aptly named Mirubuh Cottage, who is his fellow Director and Sharholder of the company! Have these so-called representatives of the people no shame or has BN become so utterly and helplessly corrupt, that these YB’s have lost sight between what is right and wrong and no longer bother to hide their misdeeds? Roads To Riches – Richard Riot MP, EXPOSE! How much was Oxford Business Group paid? More For Jabu, Fadillah Yusof and Abit Joo ! Spotlight On Masing – CORRUPTION EXCLUSIVE! Newsletter "Mega dams threaten the rainforest"
Timber concessions to MP’s family a ‘reward’?